Are you a fan of ginger? If you are, we have miraculous advice for you that will help you to grow an endless supply of ginger indoors. It is very simple and easy. Also, its low maintenance so you will not be obliged to do specific tasks. And the best thing about growing ginger is that, ginger does not have to be exposed to direct sunlight all the time. Partial sunlight will do the job. Ginger has a lot of positive effects. Even, according to the American Cancer Society, ginger is promoted as a cancer treatment. Also, people are using ginger in the food because of its numerous ways of preparation and that’s why many cultures have their own specific way of how to prepare ginger. From the medicinal aspect, there are a lot of health benefits because of the compound of the ginger. These positive effects should be enough to motivate you to grow an endless supply of ginger indoors. First, you have to purchase ginger from garden center. You have to be lucky if you find ginger from the local garden center, but give it a try because it is worth a try. The best ginger plant is purchased from garden centers and that is a fact. You can also purchase ginger from grocery stores. But, we want to let you know that often the grocery store ginger is sprayed with a growth inhibitor to keep the ginger from sprouting. But there is a solution for this. All you have to do is to put the ginger in water overnight in order to remove as much as possible growth inhibitor. No matter where you will purchase ginger, the important thing is to purchase ginger. 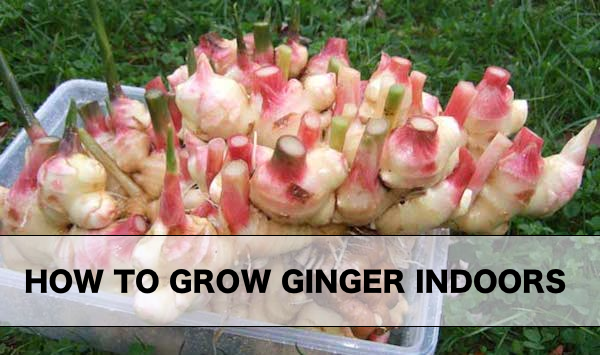 Now when you have it, you should focus on the procedure how to grow an endless supply of ginger indoors. The root of the ginger should be plump with tight skin. Also make sure that the root has eye buds on it. It would be even better if the eye buds are green. The Next thing that you have to do is to cut each bud and to put it in a different pot in order to produce several plants. The roots grow horizontally so make sure that you are using a pot that can accommodate the roots.